TV's top comic has everything. Except his sanity. Max: All I'm saying is, sometimes you gotta take a stand against the bastards. This is really a 3rd rate, made-for-television mess. First of all, there is NO 'Laughter on the 23rd Floor' or any other floor - and for a Neil Simon play that is shameful. Nathan Lane is, Nathan Lane, a short loud mouthed Jackie Gleason sounding caricature of Sid Caesar during Sid's Show of Shows era. It's supposed to be manic and inspired, but it's just loud and pointless. All the reviews here seem to imply that a great cast of fine character actors stood behind Lane and help boost the show along  I don't buy that at all. None of the assorted 'fine character' actors helped anything, all their words and actions are forced to the point of being painful, their lines were very poorly delivered and none of them were believable for even one second  for which I blame director Richard Benjamin. An almost insulting attempt at adding substance to this train wreck is the tossing in of Edward R. Morrow's legendary Joe McCarthy Show underneath and in between the overacting of Lane's lemming running toward the sea character. Then it's all tossed aside for a nice tidy and gutless ending  My mother could write better than this. The one, single redeeming element in this claptrap is the very deftly played character of Lane's brother (Harry Price) played by character actor Richard Portnow. 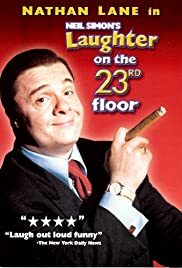 None of the other reviews even mention this guy but his is the ONLY performance worth a plug nickel in the whole show - everybody is running around frantically overacting their asses off to keep up with Lane and this guy steals the whole film out from underneath them with a quiet nod and a sheepish grin. If for some reason you feel compelled to waste your time watching this  Don't take your eyes of off Portnow, he is the ONLY reason to sit through it!